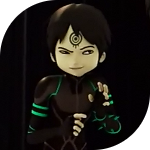 Code Lyoko Evolution has premiered, so it's time to be a little more careful in how we go about reporting and discussing news, episodes, plot points, etc. Additionally, information about S1-S4 are pretty much considered common knowledge by now so don't worry too much about posting info from those episodes. jym edit2: reminder on how to tag something as a spoiler. Now, would you want to know that before you watched the actual episode? Me thinks not.